Reconfirm that you have the best RC helicopter to learn on. Make sure your helicopter is set up correctly for learning on. Make sure you understand how your radio control system works. Check and adjust the center of gravity (CG) of the helicopter. Start thinking about RC helicopter training gear. Know some basic RC helicopter safety. Have everything ready for Day 2. 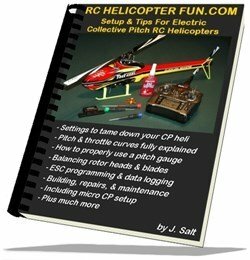 Best Size Collective Pitch RC Helicopter To Learn On? 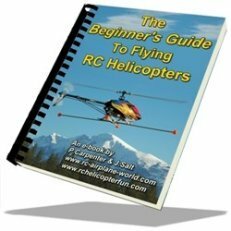 I know we already talked about this the best RC helicopter section, but in case you didn’t read that part yet I will quickly restate how important the proper helicopter is to RC helicopter training. As explained in the best helicopter size section. Most folks self learning CP flying skills these days have really good success with a 450 size or smaller electric RC helicopter just because there are no engine tuning hassles to deal with with electric power. 450's (main rotor length of about 300 to 350mm) are a nice size for most. Anything smaller than that down to the "mini & micro" sizes can be harder to learn on due to having poor wind handling immunity, overly reactive controls, and very short flight times. Small minis and micros can also be hard to see when you start flying circuits. Some people find even a 450 too small; but in general, a 450 size bird is a good compromise between stability, size, flight time, and cost. If budget is tight however or you are unwilling to commit several hundred dollars into a hobby you are not quite sure about yet, a lower cost micro collective pitch helicopter may be the best compromise. Only you know for sure how "committed" you are at this early stage in your RC helicopter flying career. 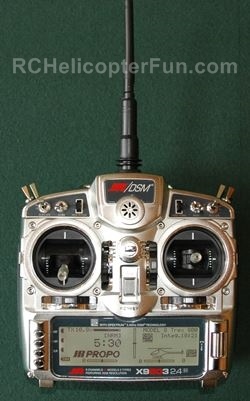 As you know by now, I believe strongly if you get into collective pitch RC helicopters, the RC transmitter (radio) is every bit as important as the bird - more so in some cases so you can transform your collective pitch machine into a good trainer. This is accomplished by reducing the collective & throttle range, cyclic pitch range, and tail rotor/yaw speed so the helicopter is less sensitive and doesn’t have the large control range that could get you into trouble quickly. A tame learning to hover setup also prevents you from auguring your helicopter into the ground when you perform a "low stick panic attack". A very natural and common tendency almost all beginners do. I have written an eBook that goes into great detail of what settings make this possible, how to do it, and why. How important is correct setup? It's the single most important aspect of learning how to fly any collective pitch RC helicopter in my opinion. As you have no doubt heard me rant on - "Everything About Collective Pitch RC Helicopter Success Is In The Setup". So how is a RC heli trainer setup different from general flight, sport, or 3D setups? Well, when you're first learning to hover, I find people are most successful if they customize their pitch & throttle curves to only the small portion of the curves where the bird hovers at and of course have a small amount of lift control to gain altitude and descend for gentle landings. When only the hover portion of the curve is used (and a little bit on either side of the curve), the throttle and more importantly collective pitch stick resolution become much finer so the student doesn't over control lift and descent control of the bird. Adjusting your cyclic and tail rotor response is also very important to tame cyclic and tail rotor control the same way as collective and throttle. Once again the whole idea is to produce finer stick control resolution. There is no reason or want to have the full range of performance a bird is capable of producing when you are first learning to hover. Think of it like learning to ski on a green run over a blue, black or double black for those skiers out there... Green = trainer, blue = general flight, black = sport flight, and double black = 3D. The same way a steep mountain slope will cause a beginner skier to gain too much speed too quickly before he/she has learned the fine balancing & technical skills required to control that speed - a RC heli that is not setup correctly for learning on will "overfly" the students skill level. Again, all this setup stuff is covered in depth in my Setup & Tips eBook. What if I have a nitro powered heli? True, most people these days learn on electric power but that doesn't mean you can't successfully learn on a nitro powered collective pitch RC helicopter. That is what we all used to learn on after all before the days of electric (me included). That said, having prior nitro experience is a huge asset so you can break in and tune the engine properly. Learning all the heli setup on top of nitro engine tuning pushes the learning curve to a near vertical level. You really need the one on one help an instructor offers if you have no prior nitro engine experience so he/she can get it all working properly before your first hover attempts. If you have prior nitro engine experience from RC cars, boats, or planes, you shouldn't have any difficulty getting one tuned and running correctly in a heli. One important tip with nitro engines and even more so with gas engines when used in a RC helicopter is to have the throttle open up at least 30-40% before the collective pitch increases too much. This will insure the engine doesn’t get bogged down and over heat by induced drag from the rotors as you begin spooling up. You will also want the throttle to be at least 65%-75% open by the time you are at half throttle, perhaps even a bit more depending on the engine and your mixture settings. Before computerized programmable radios, we had to do this with tricky servo and throttle arm geometry angles to produce a large amount of throttle movement in the first half of stick movement and a fairly small amount of throttle movement during the upper half of stick movement. Today things are much easier with programmable throttle curves. This holds true for electric RC helicopters as well, as you will have to program the throttle curve to give the correct amount of power throughout the collective range. The other tame settings we have discussed (pitch curves, and cyclic/tail), will apply equally well to all power types (electric, nitro, gas, and even turbine). If you are not fairly comfortable with your RC radio, now is the time to re-read the instructions that came with it and "play" with it a bit more. Computerized radios are somewhat complicated and it can take some time to get use to all the wonderful features they sport and get everything programmed correctly. This holds especially true for correctly setting up and levelling your your swashplate with today's electronically mixed swashplates and flybarless systems. Ensure all sticks move the control surfaces in the correct direction. For example - if you give a forward cyclic command, make sure your swashplate tilts forward and not backwards or side ways. Likewise for left and right cyclic when viewing the swashplate from behind the helicopter – left stick movement makes the swashplate tilt left and a right command tilts it to the right. An increase in your throttle/collective stick should show an increase in both your collective pitch and in your engine/motor speed. Confirming the tail rotor servo is moving in the correct direction is a little harder to understand at first. You must understand how the torque affects your RC heli to be able to figure out what direction the servo moves to change the tail rotor pitch. The instructions that come with the heli/kit should indicate what direction your servo arm or tail rotor pitch slider moves when given a left or right command. Seeing that tail rotor servo placement, main rotor and tail rotor rotational direction, and if the tail rotor is on the left or right side of the tail boom all play a roll in determining direction, there are several different possibilities. The easiest way to confirm if you have things set up correctly is to make sure if you give a right tail rotor command, you see the pitch of the tail rotor blades change so they blow air out to the right which in turn thrusts the tail boom to the left (nose of the helicopter turns right) and vice-versa for a left command. You most likely have already done this if you followed your helicopter building instructions, but now is a good time to recheck the center of gravity or "CG" for short. The CG is simply the balance point of the helicopter. You generally always want your CG at (or perhaps the very slightest bit forward) of the main rotor mast. How do you check it? 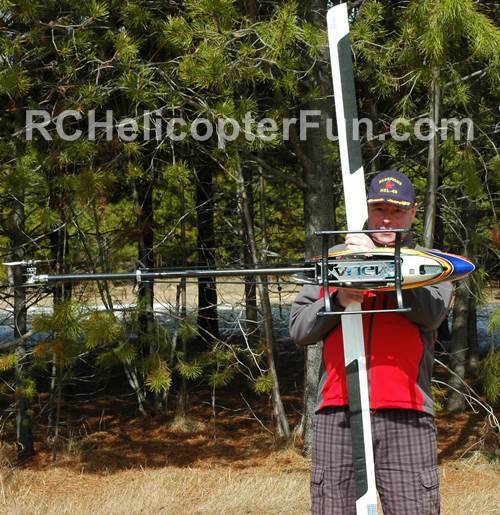 There are a few easy ways that work equally well for most RC helicopters. The first method that works equally well for both flybar and flybarless requires you to hold the helicopter by the rotor blades at or close to the blade grips sideways to the ground. If the CG is nose heavy for example when holding the heli this way, the nose will slowly rotate downward; if it's tail heavy, the tail boom will rotate downward. When the CG is perfect, the helicopter should just sit level and not rotate in either direction as seen below. 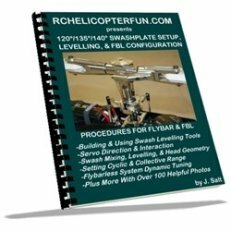 The other method is to simply pick up your helicopter by the flybar (if so equipped) so the helicopter can pivot forward and backwards. If your helicopter is level, that's perfect. If it tilts backwards, that is the last thing you want when learning. 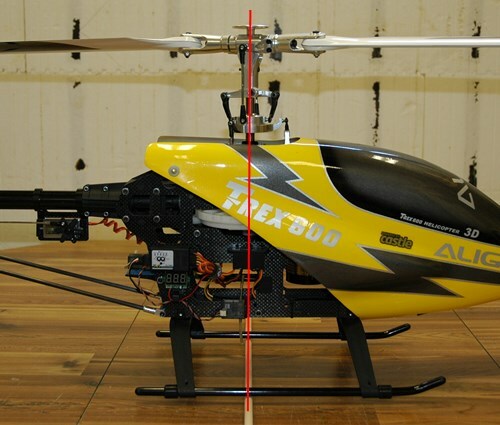 Move your receiver battery pack or main flight battery a bit closer to the nose of the heli and recheck. Here's another method that one of my web visitors uses. He puts a round dowel or similar "fulcrum" under the skids; and projects a line through the main mast down to the skids and puts a mark on the skids at that CG location. If the heli balances on the dowel at that fulcrum point directly under the main mast, you know the GC is on the money. The fourth method I also use during the build is to check the CG before mounting the rotor head by sliding a screw driver or similar "rod" through the Jesus bolt hole in the top of the rotor mast. This allows the heli to pivot forward or backward while picking it up by this "rod" in the mast. If the CG is perfect, again the helicopter should "hang" level. It's a nice way during the build just to see if things are close I find. I should mention if you have a nitro, gas, or turbine RC heli, the CG will change a bit as the fuel level changes during the flight – this is discussed in nitro fuel tank section. It is generally common practice to check your CG if you have a fuel powered model with the fuel tank/s half full and adjust with the receiver battery pack placement as required. All RC helicopter rotor blades (main and tail) are held onto the blade grips with a single bolt and lock nut. The tightness (torque) of this bolt and nut are very important and I have seen many people (newbies and seasoned fliers alike) under or over tighten them - I was guilty of this for years myself. There are several methods to check if you have your rotor blades tightened the correct amount and size of the heli is an important factor here. For 450 size heli's, this is the method I like the best. For your main rotor blades, hold your helicopter sideways to the ground with the main rotor blades out straight from the blade holders, horizontal/perpendicular to the ground. The bolts should be tight enough so the blades don't pivot in the blade holders downwards by the pull of gravity but they should be loose enough to move if you give your bird a shake. As the birds get larger, you have to tighten the blade bolts more as the blades have much more mass. As an example, once over 750mm blade size (not rotor diameter), blade bolt torque is critical and on big blades like these, you generally have to tighten the bolts so tight, the blades won't budge when the heli is held sideways and shaken. If large blades like this are too loose, they will lag during spool up and/or lead on spool down. Depending on both mass of the blade and the amount of lag/lead, it could shake your bird so badly, it could tip over while spooling up or down. Adversely, micro size helicopters need to have very loose blades within the grip. They should flop down under the pull of gravity when held side ways because there is very little mass in tiny rotor blades and for them to lead and lag properly while in flight to keep the head in dynamic balance, they need to pivot very freely in the blade grips. Tail rotor blade bolt adjustment is very much the same. They should be tightened just enough to prevent the tail rotor blades from pivoting down in the blade holder due to the pull of gravity on them. Because the mass of tail rotor blades, even on large RC helis is relatively low, the same method of testing tail blade bolt torque will work on most RC helicopters. I will just touch on this now; a more in depth discussion is given during the how to fly RC helicopter Day 3 lesson. You will need to purchase or build a set of training gear for your helicopter. Training gear will save your RC heli from tipping over when you are first learning to hover. Check out day 3 for more information. As I have indicated several times in this web site, RC helicopters are potentially the most dangerous of all RC vehicles. When you are first learning how to fly RC helicopters, specifically learning how to hover, the danger is not as great as it is when you are starting to fly around. After all, the heli will (hopefully) be staying close to the ground and be confined to a small area of the field. The reason you want to think a bit about safety right now on day 1 is to determine where you will be going for your first hover attempts during days 3 and 4. The last thing you want is a location with lots people around. This is not only dangerous for them, but very distracting for you. You should go out alone or with one person maximum to assist you. If you learn at a RC helicopter club, they should have a practice area away from the main flight line. You will need maximum concentration – distractions are the worst! This is not the time to have all your buds come out and watch your first baby steps. Also leave Fido at home – man have I heard some pretty messy horror stories about dogs going after RC helicopters. Almost happened to me once with an off leash dog, but that is another story. You will need a nice large open area free of any obstacles. Clean dust free pavement or packed snow/ice are the best choices (more on this during Day 3). When learning to hover, you won’t need as much room as when you start flying circuits, but you should have an area of at least 20m by 20m (60 feet by 60 feet) the bigger the better. Once you start flying circuits you will need much more room (unless you are practicing with a micro sized heli of course). Well, time to wrap up day 1 pre-flight learning how to fly RC helicopters. Make sure your radio, helicopter, and receiver batteries (if your bird uses a dedicated Rx pack) are fully charged for tomorrow. Get your field box ready and have your power panel, glow plug driver, or starter batteries all charged up if you are learning on nitro. A quick glance at the weather report doesn't hurt. Nothing worse than being all geared up, only to wake-up to gale force winds or rain. Onto Day 2 – Your First Spool Up & Blade Tracking adjustments.